as christians, are you go-getters or wimps? 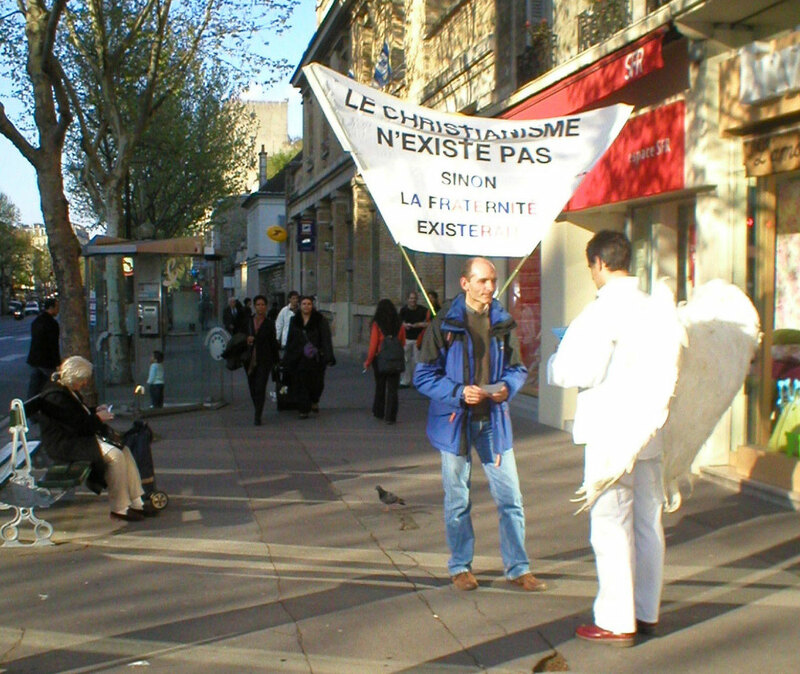 The Ares Pilgrims' mission is campaigning in Paris for the awakening of public consciousness that there has been no christianity on earth yet. This is The Revelation of Ares' gist! or else there would be such a thing as brotherhood." This spiritual campaign as well as a lot of previous similar operations evidence the Ares Pilgrims' greatest regard for love, generosity of spirit, forgiveness, peace, spiritual intelligence, freedom from prejudices, as cardinal virtues that meet the Gospel's requirements much more than abstract faith clauses like the trinity or sinners' redeeming through the cross. Sinners are redeemed by their own efforts to be good, which The Revelation of Ares merely calls penitence (30/11), a word that it transforms in signification by shifting its sense from remorse and atonement into self-(re)creation, regainment of the divineness given man by the Maker (Genesis 1/27, Rev of Ares 2/13). Which does not mean that the Ares Pilgrims despise their fellow Christians associated with the churches or their fellow believers, Jews, Muslims, etc., since the Father definitely saves whoever he wants to (Rev of Ares 11/3). Not only do we know for certain that penitents, good men, are saved, whatever religion or philosophy they belong in, but we know that they contribute to the world's change (28/7) for the better, for terminal global salvation. When it comes to plain, real christianity, are you go-getters or wimps? For every human engrossed with the need to achieve the ascent to the Heights (Rev of Ares 36/14) there appears another human, highspirited, to accept to become a penitent, so that the world may change little by little. The Americans say, "Liberty and Justice," the French, "Liberté, Egalité, Fraternité." It seems to me the French are right; liberty and justice can only prevail if all citizens realize that they, each and every one, must take up arms if any one is wronged. That is solidarity, righteousness, or, among nations, collective security. The Jews are just having their annual Holocaust Memorial: the theme is "Are you an Upstander?"